Countdown 2 (Extinction!). Genetic Algorithms! In the last post we saw how how we could encode solutions to the Countdown numbers game as strings, and write Sniff code to both generate potential solutions and evaluate them. Using brute force we could generate thousands of solutions, and test them until we found a good one. It actually worked pretty well but it required a lot of trials to find solutions for trickier problems. In comparison we can be pretty sure that a human player could only check perhaps at most 50 solutions in the 30 seconds available to play the game? There's obviously a better solution, but what? The computer generates a guess, tests it and if it doesn't work throws it away. By comparison, a human would also make guess and test it. Leaving aside that the humans "guess" probably isn't entirely random, when a human gets a "close" guess they don't throw it away for not being perfect - they try and "fix" it. If I need to make 804 and I gave 50 4 4 and 1, my first try might be 50x4x4 to get 800. That's pretty good. Rather than starting over I'd realise I can tweak the solution to give (50x4+1)x4=804. Of course humans use all sorts of "skill and judgement" to arrive at good solutions, but the basic idea of taking a good solution and tweaking it to see if we can find a better one is the basis of "Genetic Algorithms". A GA operates by generating a whole load of random solutions (we've done that already), and then testing them against a "fitness function" - how good a solution are they? Bad solutions are thrown away, and good ones get to produce offspring - solutions which are similar, but not exactly the same as the known good solution. The hope is that the offspring will keep the best bits of their parents, and maybe even improve, producing new, better solutions. There are two main ways of generating new potential offspring from a known good solution. The first is mutation - just go through and randomly change some of the characters. For example if we want 101, and we have a promising solution of 4x25-1=99, then it might mutate next time of "4x25+1=101. The other option is "crossover" where you take two good solutions, and pick the best bits from each. For example to make 125 we could have tried 5x5+50+10+10=95 and 50-5-5+10x10=140. They're both ok-ish solutions so but if we take the first part of the first one, and the second half of the second we get 5x5+10x10. Mutating the card numbers would be tricky, so to keep things simple we just mutate the operations - that way we're sure that the new rule is valid. If we were to start changing the numbers we'd need to make sure we didn't use the same one twice, and swapping numbers of operators would upset the "balance". Similarly crossover is a bit tricky, but there's a simpler way to handle it, which in many ways resembles a human approach - if we want 803, then we would start with 100x8=800, then start tagging things on the end to get a better solution. If they don't work we go back to 8x100 and try different things. With a but of tweaking we can modify our random solution generator to be a random solution comption script (making a new solution is just completing the empty string). Now we can start by making 10 potential solutions and adding them to a population list. We then go through the population evaluating them. We keep track of the best one we've found, and if a solution is 10 times worse than the best we throw it away. Then for each good solution we generate some new ones by truncating (and completing) the good one, mutating it and adding it into the new populations. Using brute force we find the solution:((8+((75*(9+4))-6))+2) after trying 56779 potential solutions. Our GA tries only 6296. However it didn't always work so well. Given 803, and the numbers 100, 75, 10, 2, 2 ,8 the obvious solution is to start by multiplying 8x100 to get 800, and then mess around with 10, 2, 2 and 75 to get the remaining three. I suspect I'd end up with 802, or 804. It turns out there is an "easy" exact solution: (9+2)+(75-2)=803. The reason we miss it is that we're stuck in a "local minima". We've found a "good" solution, and we think we can tweak it to get a perfect one, when in fact the perfect solution looks nothing like the "good" one. The random generator will eventually find the perfect solution, but our smarter GA gets stuck trying to tweak the good one. Of course a human would eventually give up. In fact our truncation stategey will occasionally throw out a rule completly and generate an entirely new candidate, but it still wastes a lot of trials. Looking at some of the really bad results for the GA (When it did much worse than random), we saw that often is was the result of a divide. The better the solution we have, the more likely we are to throw out other solutions: if our solution is 5 away, then anything that is within 50 gets to play the next round. However we occasionally say results where we were 0.3 away, so almost all other solutions were discarded. Adding some code to block non-integer divides improves perfornance further, and we find our solution to 979 in only 729 trials! That's almost 100 times faster than brute force!!! That gain however isn't representative: Over 1000 test puzzles, brute force averaged 60,597 attempts before getting the solution, while the GA averages 33,255. That's still a 50% improvement. The GA did better than random on a slightly disappointing 623 of the 1000 tests, but that's not really the whole story - subjectively brute did better on very easy and very hard puzzles. Sometimes brute force got lucky and found the solution to easy puzzles in under 1000 trials. For such easy puzzles, just guessing was likely to find and answer more quickly than trying to work it out. For some the harder puzzles the GA got locked into local minima. However when GA did work (as in the 979 test) it showed some really good results. The code for all this will be in the next Sniff release. There's lots more you could do with this - at least try changing the initial population size, number of offspring, and criterea for killing candidates. More complex mutation and crossover strategies would also be worth investigation, or try applying the approach to different number puzzles. Countdown to extinction is of course also the title of a Megadeth album, and not one but three Transformers episodes! Countdown is a TV show that frustrates me as a maths/engineering person... The numbers game is great but I have to sit through four rounds of anagrams to get one maths puzzle (consider what that says about how society values technical skills vs literary skills...). Fortunately here I make the rules, so we're just doing the numbers game! Pick up to four "big" numbers (but usually 1, sometimes 2 rarely more), then make that up up 6 selections using small numbers. Then a random number between 100 and 999 is generated. Now in 30 seconds use your mental arithmetic skills to derive the big number from the small number. It turns out this has some real merit as a game: As this Real Maths analysis shows provided you pick 1 big number the statistics fall in a sweet spot that the solution is almost always possible, but only rarely obvious. I fancied writing a program to solve Countdown puzzles in Sniff, so here's my first go at it. To start with we need to generate a random puzzle to solve: a target number (Easy), and a set of numbers to make it from (not so easy). To generate a typical set of cards, we create a list sourceN which initially we fill with the big cards. 1 time in 5 we take two of those, otherwise we take 1. We then fill sourceN with 2 of each of the numbers 1 to 10, and fill up N with randomly selected cards (remembering to delete them from sournceN when they're picked). We're going to need to generate solutions and check it to see if they work. Which raises the critical question of what does a solution look like? (50+7+4)*(3+10)+3. Thats a pretty neat solution (if you know what 61*13 is! ), but the problem is that regular maths notation is just too messy. For a start we need to remember that we * before we +, and when we don't want to do that we have to put brackets in to make sure everything works properly. Writing code to understand that is pretty hard. We can make things a bit easier if we always put brackets in:(((50+(7+4))*(3+10))+3). Now we don't have to worry about what order to do things in, but its still tricky. Regular maths notation is great for representing equations, but not great for helping you do calculations. What we want is a notation that actually gives us a set of instructions for doing the maths. The way we generally do that is using "Reverse Polish" notation :RPN (that's as in the country, not the cleaning product). Instead of writing 1+2 we write 1 2 +. To evaluate an expression you just work from left to right. When you see a number you append it to the end of a list of numbers called the "stack". When you see an operator (+) you use the last two numbers in the list, remove them from that list and put the result back at the end of the list. So here we "push" 1 and 2 onto the stack, the perform a "+" which removes those, adds them, and puts the resulting 3 onto the stack. If we want to evaluate 1+2*3 we could write in in RPN as 1 2 3 * +. Push 1, push 2, push 3 now multiply the top two (2 and 3) so that leaves 1 and 6 on the stack. Now add, to leave 7. If we actually wanted (1+2)*3 we would write it as 1 2 + 3 *. Push 1 and 2, add them to leave 3. push another 3, multiply them to get 9. To evaluate a candidate string we simply go through one letter at a time and "follow the instructions". When we see an operator we perform the operation. When we see a number we treat it as a card number, get that card from the deck, and put it on the stack. As there are only six cards, we'll use the numbers 1 to 6 to represent the 6 cards, so we know that 25 means card 2 then card 5, rather than having the potential to confuse 2, 5 and 25. So our rules are going to look something like: 34*2+56++ (Card 3 *Card 4)+Card2+Card5+Card6. ....set candidate to join candidate "*"
.....set candidate to join candidate "+"
......set candidate to join candidate "-"
......set candidate to join candidate "/"
We put the numbers 1 to 6 to represent the 6 cards into sourceN and we remove them as we use them to that we don't use each card more than once. We then generate a string one l letter at a time - each letter being either a card number or an operator. Nominally we pick a random number and choose each equally, but there are restrictions. We can't pick a number if there are no cards left. We can't pick an operator if there are no numbers on the stack to use. We keep track of how many numbers are on the stack using "balance". Initially it starts of as 0. When we add a card it increases by 1. When we add an operator it decreases by 1. If balance <2 then we can't perform any operators. If balance becomes large we probably shouldn't add any more numbers. We keep going until we have a string longer than 5 characters with a balance 1 (the answer we hope!). Most solutions use * and + a lot, - a occasionally, and / almost never, so if we choose to select an operator then we bias the selection towards the more common operators. It would be interesting to see if in fact there are large numbers of solutions that could use division but simply don't because its "less obvious". However the danger is that division takes us out of the Natural numbers. We strictly shouldn't use fractions or negative numbers, but I've allowed them because they'd complicate the code, and I think that almost any solution which uses them would have an obviously equivalent solution that uses just Natural numbers. As a final trick, I wrote another script "prettyPrintCandidate". This operates pretty much the same as evaluateCandidate, but instead of calculating the result of the calculation it calculates the regular string representation of the expression so 12+ becomes (1+2). The code works supprisingly well, and actually performs similarly to a human player - with 10,000 tests it gets most smaller targets, and does pretty well on targer targets, sometimes getting them, and often being 1 or 2 off. One quirk, because we don't disallow fractions is that it produces non-integer "close" answers - occasionally being off by 2/3's. A few years ago Blackberry had a promotion for developers to try and get them to support their Playbook tablet - write an App, and submit it to their App store and they'd send you a free Playbook. At the time the Playbook was decent hardware and was pretty cheap, so I bought one wrote a simple game, give it away on the app store, and got a second playbook free. I planned use them for more serious dev work and port some of my other code to them. The app I wrote to get a free Playbook was a fun little game called "Catch The Flowers". 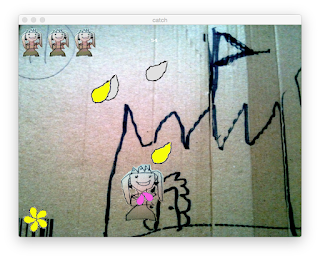 My daughter was off school feeling unwell (she was probably in year R or maybe year 1), and to pass the time we designed the game, and she drew the artwork on the side of an old cardboard box. I just photographed it and used it with the minimum of editing and tidying. This is a great approach, as the hand-drawn images capture the fun of the game far better than digitaly produced images could. As we've been developing a sprite system for Sniff it seemed like a good idea to revisit the game and port (i.e. rewrite) it to run in Sniff on something other than an old unsupported tablet. The aim of the game is to collect flowers - petals fall from the sky, and you catch them one at a time. When you catch 5 they make a flower which appears in the bottom left. The problem is that each flower needs to be a single colour. There are 4 colours of petals and once you start catching one type you need to complete the flower in that colour - mixing the colours costs you a life (and the petals in the current flower). White are the most common flower, and Pink the rarest, so collecting a whole flower of Pink is much harder, and scores accordingly. When you collect a whole flower an extra falling petal is added to the game - you might think this makes it easier but when the number of petals increase it gets harder to avoid the wrong colours. Most of the code to write this is similar to the previous game examples where we make a sprite device, and move it around based on the keys that are pressed. 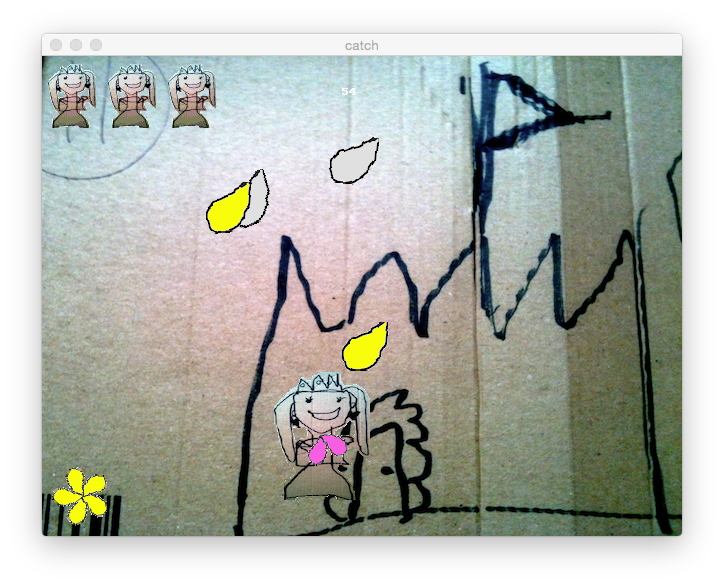 We set up the Princess and Background sprites, just we have previously. However the petals, completed flowers and the lives remaining need a bit more attention. .tell miniPrincess to "load costume"
.tell miniPrincess to "set unhittable"
..tell miniPrincess to "move to"
...tell miniPrincess to "move by"
After we've drawn the main sprite list we call "draw" on the sprite ourselves to stamp the required number of princesses to indicate the number of remaining lives. We use a similar approach to drawing the completed flowers, and the flower that's being collected. The real interesting aspect of the game however is the main falling petals. So far we've created sprites when we write the code by making a sprite device. However sometimes we can't do that - we don't know how many petals are going to be falling, as the number increases as you progress through the game. Technically we need to "dynamically allocate" sprites - make them when we run the game, rather than fixing them into the code. .tell mySprite to "get id"
Every sprite has an ID, which you can get by telling to to "get id". We can then perform operations using the spriteID and the spriteManager rather than the sprite itself. This might seem like a waste of time, but it has a couple of advantages. .tell spriteManager to "make sprite"
.tell spriteManager to "load costume"
...tell spriteManager to "move by"
...tell spriteManager to "check touching"
....tell spriteManager to "get costume"
......tell princess to "set unhittable"
We check the petals colour (by getting its costume). If its the first petal in the flower then we use that colour. If not, we check that its the right colour. If it is then we record we've got one more. If we've collected 5, then we record we've completed a flower. If we've collected the wrong colour petal, then reset the flower, and subtract a life. This whole block of code is quite dense, but it does fairly clearly sumarise the game logic! One of the important ideas behind Sniff and the way we develop and promote it is that computing is pretty limited if it just lives in the computing classroom. That's why we've covered examples which use Sniff in Maths, Physics, Biology, English, Geography, and just about any other subject we can think of. Today we add PE to that list! The "Beep" test (also known as the shuttle test) is an exercise designed to measure aerobic fitness. First we make two lines 20m apart that you're going to run between. You start at the first line, and when you hear the beep you run to the second line. If you get there before the next beep, then congratulations you get a bit of a rest, till the next beep, when you run back. Every minute you'll hear a triple beep, which means that the beeps are going to get a little closer together. Eventually it will speed up to the point that you don't make the line. That's OK - the first time it happens just turn around and start running back. However if you miss a second beep you're out. The fine print/technical details are that initially you need to run at 8kph. At the first triple beep that increases to 9kph, and it increase a further 0.5kph on each subsequent triple beep. Each level consists of the minimum number of shuttles to last over 1 minute. (though there are variations on this). Technically there are 21 levels, but professional athletes start dropping out as early as level 13. Note because you're running to exhaustion, this isn't recommended of for unfit adults - however kids generally don't have to worry about heart attacks, so its considered pretty good for them! The traditional way to do this is to use a prerecorded audio track, but now we know the rules we can make our own beep test machine, using an arduino. Lets start, initialising some variables. We stricty don't need a distance variable, as its always 20, but it will make our code look nicer to use the name rather than hard coding the value. So make a beep (we'll figure that out later! ), and then repeat for the 21 levels of the test. The rules tell us the speed in kph but that doeesn't really help. Problem solving 101: convert to SI units. Multiply by 1000 to get meters per hour, then divide by 3600 to get meters per second. Now we have the speed in a useful form, we can find the time interval between the beeps as distance/speed. Now we know the interval, we calculate the time 1 minute in the future. We're going to keep going on this level until we've done more than a minute. So then wait for 1 time interval (everyone runs! ), then beep. Everyone should have got to the end, and start running back. Then back round the loop to check if they've been running for more than 1 minute. When we have got more than a minute, we sound a triple beep. Finally we bump the level and the speed, ready to go around again. One of the great things about Sniff is that these run at the same time as the main script, so don't affect the timing. You might also note that triple beep will start while beep is still running. That's OK, as it just restarts beep, and it sounds exactly as it should. All would be great, and this "should" work but there's a nasty edge case. If you check the timing chart you'll notice something fishy about level 8... At that level you should be running at 12kph, which gives an interval of exactly 6 seconds. So how many shuttles should you do? Well 10 shuttles would take 60 seconds, but look at the fine print... you need run each level for more than a minute, and so the official chart says you need 11 shuttles. Technically level 20 is similar, but that's not going to be an issue for pretty much anyone. So how will our code behave? It looks like it should work, but are you sure? We're asking the computer to measure multiple 6 second intervals, and compare them to one 60 second interval. They should be the same, but that's not going to happen. We can be pretty sure that the code will actually take longer than 6 seconds to go around the loop, as it needs to do the tests and go back to the start of the loop as well as wait the 6 seconds. There's a pretty good chance it could take longer than a minute to measure 10, six second intervals - perhaps just a 10,000th of a second longer, but that would be enough to give us the wrong answer. We divide 60 seconds by interval to tell us how many intervals would make exactly one minute, and then we round it to a whole number. However first we add 0.5 so that it always rounds UP. 60/6 is 10, but 10+0.5=10.5, which rounds UP to 11 - the correct answer. Best of all we can easily check that this works by removing the delays, and adding some "say"s. Without the delays and edgy timing we can run the code in a second, and compare it to the chart, rather than have to wait 25 minutes to check its working. I ran the code on an Arduino with a multi shield attached, which has a buzzer build in. It also has 7 segment display, so you can make a really nice device. If you want to build something really cool you can get 7 segment displays over 15cm tall, and build a beep test machine for your school gym! This is the 100th post to the Sniff blog, and its a really fun one. The Leap Motion controller is like a Kinect for your hands (though the way it works is very different). It tracks your hands as you wave them around, and when it works its really amazing. In principle it can recognise the position of each joint of each finger and track it to milimeter accuracy. In practise it does that sometimes, then freaks out for a while, but its still super fun to play with. That's a lot of variables - because the Leap produces a lot of data! However we're not going to be using the direction or the velocity in this example - just the positions. To get started here's the basic code to track a hand. We don't know which hand (yet), so we set the handName to "", and we're not interested in a specific finger, so we set fingerNum to 0. Then we ask the leap to do its thing! If it finds a hand, then it tells is which it found, and fills in all the other variables, so we can print the hands position. EASY! You could take the XY positions and use that to move a sprite round the screen in a game! We can use fingerNum to track specific fingers, so we're pretty much ready to go and build R/P/S. The easiest way to do this is figure the distance that each finger tip is away from the centre of the hand - big number means extended, small number means closed in. We start by getting a hand. We then go through and get the position for each finger, and use pythagoras to work out the distance from the hand to the finger tip. Note that asking for the hand position will set a handName, which means that when we ask for fingers (2-5 - we ignore the thumb) we're using the hand we've already found. Distances are in mm, and for my (large-ish!) hands I found 70m worked well as a cut of point between fingers being "in" or extended - adjust based on personal physique! If all the fingers are less than threshold then its "Rock!". If index and middle are the only two extended its "Scissors! ", and if all are extended its "Paper!". The results are surprisingly successful! It occasionally does loose track but its still pretty impressive (it can be helpful to just view the gestures in the Leap "visualizer" tool - if your gestures aren't clear in the visualiser then your own sw isn't going to stand a chance!). We've cut down the Leap API to produce something that's really easy to program, but still keeps most of the potential. The code for this is included in the current Sniff release. We've tested on a Mac, but it should work on other platforms - our older Windows and Linux build boxes are too slow to run the leap motion tracker, so let us know how you get on! Playing Rock Paper Scissors with a computer is REALLY fun! The first step is to install Emscripten, and update to the latest version of Sniff. With that done, you can write your Sniff program pretty much as normal, and compile it with the command "jsniff". This will produce a version of your code which you can then use online! That's basically all there is to it, though there are couple of minor things you need to watch for. In addition to the actually js output file, we also generate an html file, so you can run your program by just opening the html file. However most modern web browsers won't let a web page start loading up file from your local hard disk. You need to place the files on a web server to access them (or use Firefox which still lets you do this!). Provided you bundle the files in at compile time, you can read files just as normal. You can also write files, but they get thrown away when your program finishes - thats just the web way! The only other weirdness is that "ask" will pop up a modal dialog box, pausing your whole program. It works fine, but you can't run other scripts while the "ask" box is on screen. Appart from that it just works. If you're running some kind of workshop you can write code to run on the local machine, and when you're done just put it on a website so everyone can see it! 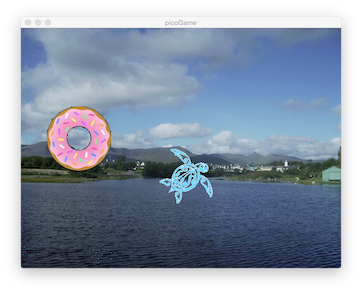 Everyone loves games, and Scratch makes it really easy to build simple games. However when we built Sniff we wanted it to be more like a "real" programming language, that could be used to solve all sorts of problems - not just sprite based games. But of course that doesn't mean that writing sprite based games isn't fun! As we're rounding out the support for Sniff, we've now added support for Sprites, so you can write Scratch like games. However Sprites aren't part of the language as they are in Scratch - they're devices. While this means the two systems aren't exactly alike, it makes the implementation a lot cleaner, and makes it possible to do things that would be very difficult in Scratch. We'll be developing the documentation for this over the next few weeks, but here's a brief introduction (and you can check the examples in SNIFF/examples/Hosted/sprite). We start by making a whole bunch of devices and variables. The SpriteManager is going to look after all of our sprites. We'll use it more in part 2 of this tutorial, but its most important user facing task at this stage is to handle the drawing. You can ask individual sprites to draw, but for simple games, we're just going to task the spriteManager to "drawAll". We can put this in a separate script and just let it run. The sprite manager uses the display device (which currently has to be a window, but we hope to support other display types in the future), which in turn uses a nativeFile device. We make three sprite devices, starting with the background - by default they get drawn in the order they're created, so background has to go first. We then load up some images to set the appearance of each sprite. Here we've only loaded up one costume per sprite, but you can add up to 8, just by calling loadCostume again. "setCostume" and "nextCostume" let you cycle through the different appearances. To move things around, we can use XY coordinates to set (moveTo) or adjust (moveBy) the players position). We can also find the players position using "getPosition". The background takes no real part in the game, so we set it to be unhittable. Similarly we're interested in the player hitting the donut, rather than the donut hitting the player, so we set the donut as hittable, and the player as unhittable. We call "checkTouching" on a sprite to discover it its hit something hittable. If it has (in this case) it must be the donut, in which case we increase the score by 1, and move the donut to a new random location. Using these basic sprite functions its possible to write the standard chase the target, Scratch type games in Sniff. In addition Sniff has a much more powerful way of dynamically creating sprites through the SpriteManager, so you can spawn new sprites as your game is running, rather than having to code them all at compile time. The two approaches play nice together, so you can migrate to the advanced API when you're ready, but we'll leave that till next time.